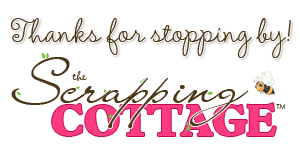 For my card today, I used the adorable Cottage Impressions Pig Stamp! 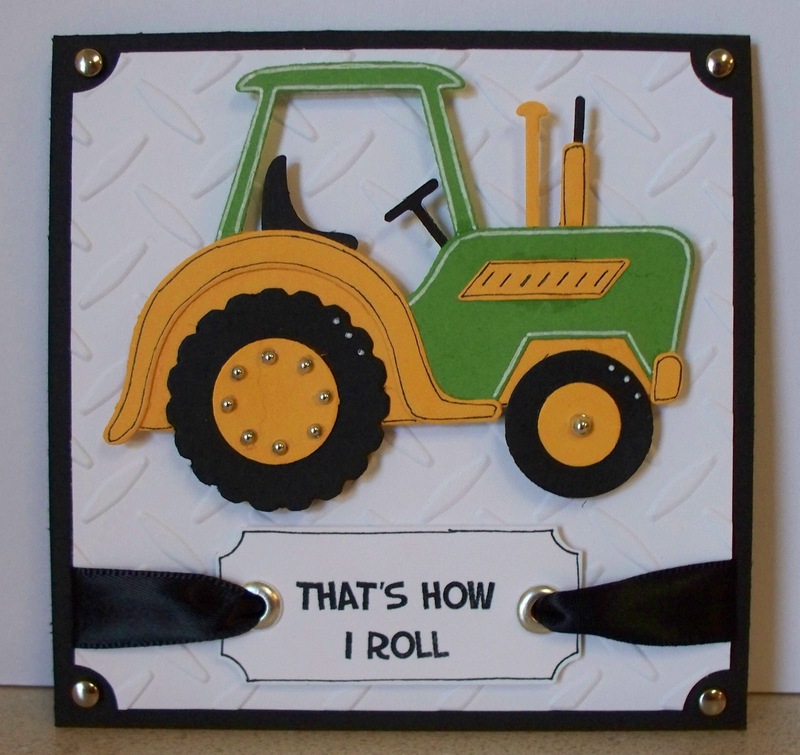 The sentiment is from the Farm Phrases Stamps. I love all the stamps from the On The Farm Release! I stamped a mirror image of the pig because I wanted to make a "Couple". If you would like to see a mini tutorial on how I mirror stamp you may click here. I colored the images with copics. I colored the scene and drew a bow onto scrap paper and popped it onto the girl pig. I also drew some eyelashes on her. The twine is from the Twinery. Have a great week! I hope you have a wonderful week! See you back here next Sunday. My youngest daughter is really becoming quite the little reader. In an effort to reinforce how well she is doing and how proud I am of her reading, I decided to make her a little bookmark. The Cottage Cutz Mini's are perfect for fun and quick little projects like this one. There are so many cute little shapes to choose from that I can always find just want I am looking for with any project. 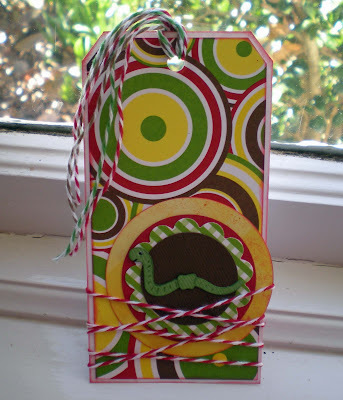 For my bookmark, I couldn't help but pull out my little Cottage Cutz Mini Worm. I think he is just the cutest little thing and the perfect accent for my bookworm project. I hope you are all having a fun and scrappy Saturday!! Happy crafting! Hello and happy Friday, friends! I'm running late this morning! We had a snow storm last night, and there's a fresh 6 inches of the white stuff on the ground. A late night combined with a cold and overcast morning had me sleeping in, and therefore, running behind with everything today! Oh well, it WAS some good sleeping weather! I have a card for you today that I made with my ever favorite Cottage Impressions stamps from the farm release. For this card, I used the Sheep Stamp and the Farm Phrases stamps (set of 7). I'm having a lot of fun with this particular release, and I'm especially enjoying the chance to color these adorable images! Coloring the sheep was easy peasy with a technique I learned at the Intermediate Copic certification class that I took last fall, and be sure to check out my blog tomorrow, because I plan to have a video to share that focuses on this particular technique, using this stamp. 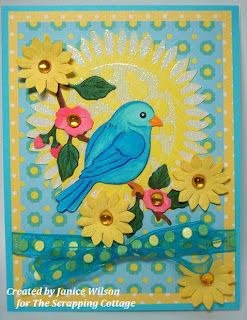 I used kraft and barely banana card stock for this card, and the patterned paper is from an Imaginisce 12x12 stack called Exotic East. For embellishments, I used some brads, grosgrain ribbon, and a cute little clip to hold the sentiment to the ribbon. I finished this card off with a little hand drawn doodling around the edge of the image. That pretty much does it for this card. Thanks so much for stopping by today! 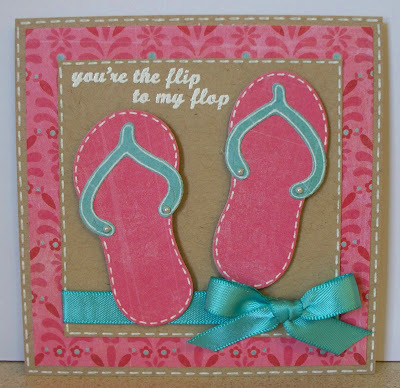 I wish you a blessed day, a wonderful weekend and lots of happy stamping! Hearts represent LOVE and this Flourish Tree is a perfect way to send some love to someone you care about. It doesn't have to be Valentine's Day to use this die. This weeks card is a Happy Birthday Card made with three Cottage Cutz Dies, Puppy in House, Simple Tree and Dog Biscuit. I am first showing you the envelope, because this weeks card is thick I needed to make the envelope slightly large to handle the thick card. I also used the post-it note pad trick. When you are about to glue the three flaps of your envelope down. . take a post-it note pad and peel it down to about the height of your card and slip into the envelope. . than clue the three envelop flaps. This will glue the envelope with a slight dome or puff. This make is easlier to slip a thick card into the envelope. You will also notice the bone dangle hanging outside the envelope. The dangle is really attached to the card. It adds a nice element to the outside of the envelope. The two picture kind of show you the general drift of how the dowghouse will be constructed. I cut the dog house out four times, cut slits on each side of the door and ran card stock down the sides to connect. The biggest isses is to make the slits about twise the width of the card stock thickness that you will be running through the slit and the tabs wider than the slits. (It's Magic!) . This is the only way for the paper to freely move. (open and flatten) It's hard to give you messurements, I tend to just wing it. . but try it with basic retangles of card stock to play around. 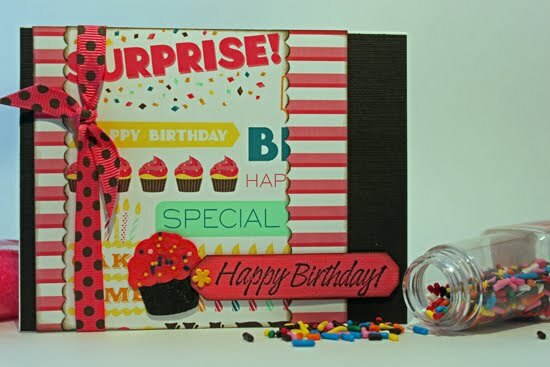 There are a few precuts out there that use the cut half way up from the bottom on one piece of card stock and half way down on the other sheet of card stock. . but than you loose the shape of the item. (and fall apart) By bridging through the paper design the object will not only stay together better. . but will keep its shape. the card and slip into the envelope. I hope that you have had a great weekend! See you next Sunday! Good morning! Down on the farm. That's where I am each and every day, and these sweet Cottage Impressions farm images are very near and dear to me just for that reason. I think you all know that coloring is my favorite thing to do, and when I saw these adorable images, I couldn't hardly wait to color them!! 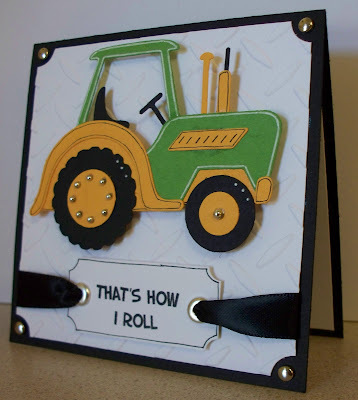 This one is the Farm Boy stamp and the entire line can be found at The Scrapping Cottage. so if you haven't checked those out, you should head over there and do just that! 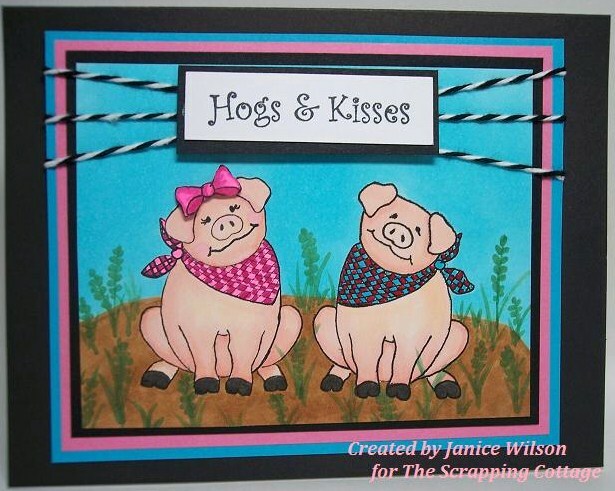 Wouldn't these make the cutest scrapbook pages to capture a fun of a day at the farm? The possibilities are endless with these. I can use this for nearly any kind of card, and I'm sure if one was clever with words, one could come up with a snappy little sentiment making reference to that pitchfork. :) LOL!! 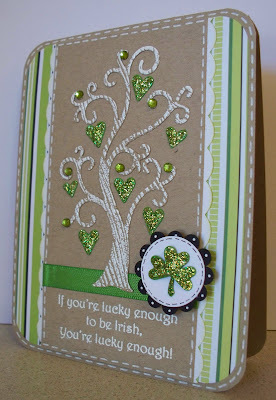 In addition to the adorable stamp, I used my Cottage Cutz Rick-Rack Edger for the background on this card. I love the versatility of that thing!!! The image was stamped with Memento Tuxedo Black ink, and colored with Copic Markers, and the paper is all from my scrap tub, but I believe it came from K&Co. I have more of these cutie patootie farm stamps to play with, so be looking for those soon! Have a beautiful day, and happy stamping! 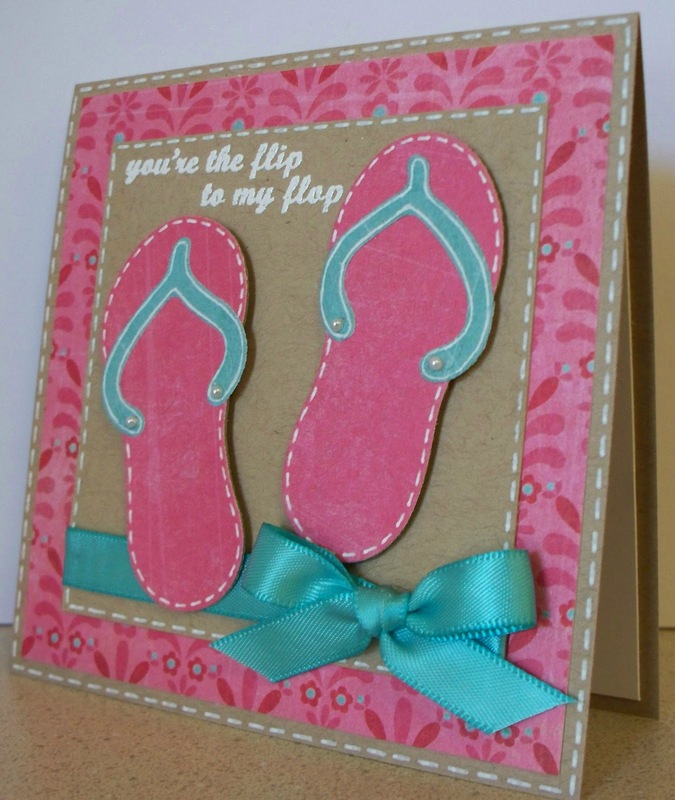 For this simple card, I used the adorable Cottage Cutz frog on lily pad. But for an extra fun touch, I cut the "flies" from plastic and put them on wire to make them appear to be buzzing over the toad's head! I also used googly eyes for the frog, so he may have a little trouble seeing the flies at first. He looks a little buggy-eyed! Haha!! If you saw Nikki's post on Sunday you probably noticed how she took a Valentine die and made it work for St. Patrick's Day. I love the way the CottageCutz dies are so veratile this way. 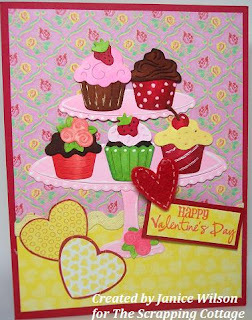 In my card below I used the CUPCAKE MINI die from the Valentine release and left the heart off but added sprinkles to match my patterned paper. I used the tiny holes from the CIRCLES W/EYELETS die to make the sprinkles. I took a few scraps and ran them through my diecut machine and then popped out the holes over my cupcake that I had applied Glossy Accents to. We'd love to hear from you and how you've adapted your CottageCutz dies to meet your needs on a project. Really! Really. . .No RED. . .are we past all the red holidays? . . .Yes we are finally into Spring. . . Yellows. . .Pinks. . .Lavendars. . . This week I decided to do a wee bit of green and yellow to create a few quick gifts. I used a large glass mug (found at the dollar store) and filled a cello bag with chocolate & nut covered caramel popcorn and tied the bag with green, yellow ribbon and gold metallic cord. I am sorry I can not tell you how much popcorn to use. . I ate so much out of the bag while I was working on the project. . well . . . I think I ate more than I used. . .so the thought is . . . . buy three times as much as you think you will need. ! ! ! ! I used the Cottage Cutz Postage Stamp and Beer Mug Die to create a tag to tie to the side of the glass mug. 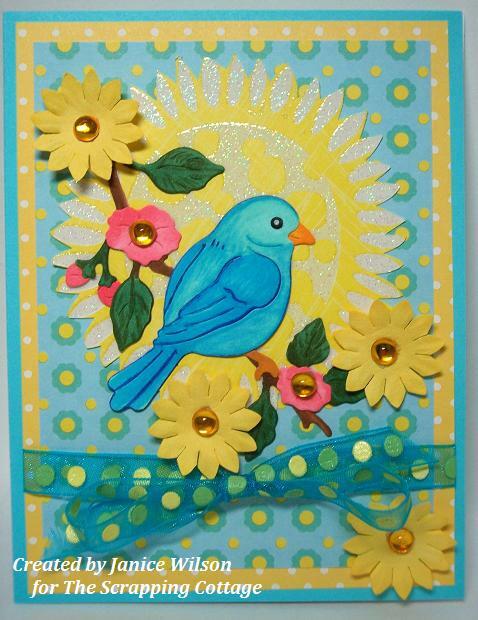 I used Bazzill Bling cardstock for most of the tag. The golden yellow from Bazzill Bling is such a good beer color (also great for sunflowers). I used black cardstock for the postage stamp to have a really dark backround so the greens, golds and white would pop. I highlighted the gold cardstock in brown ink with a sponge. I went ahead and highlighted the bubbles and glass stripes before punching them out. . .that is another cool thing about Bazzill Bling paper, the die WILL cut the paper. . but the thickness of the paper alows it to hold really well until YOU want to punch it out. . . .no lost pieces. The pillow bag of popcorn was wrapped with a strip of cardstock and the tag was added like a buckle on a belt. I used the Cottage Cutz Beer Mug Die and also used the Label Die. 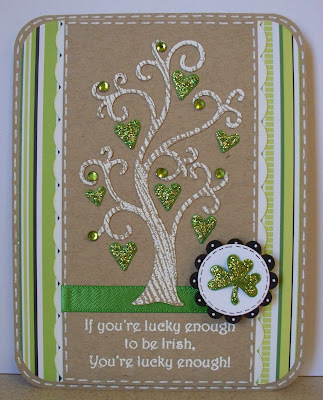 Also on both pieces if you noticed the very small shamrocks. . .they are from the Cottage Cutz Irish Pub Die. 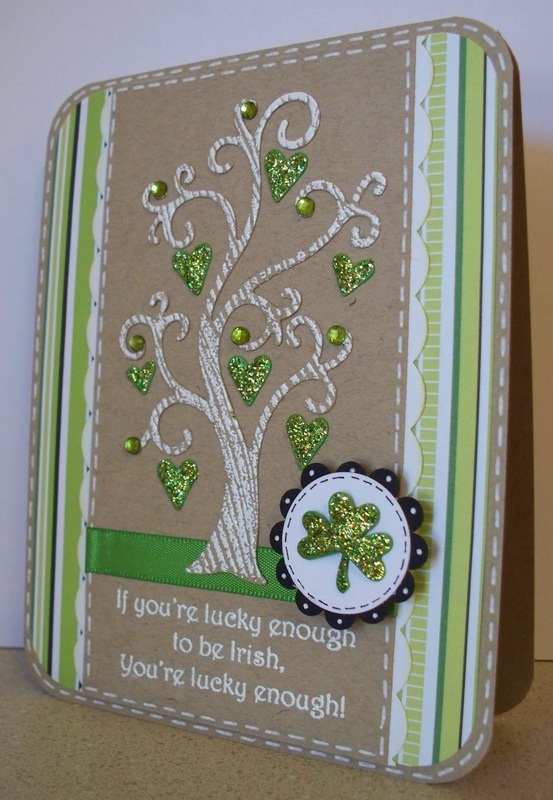 I wanted to add a few shamrocks. . and thought . 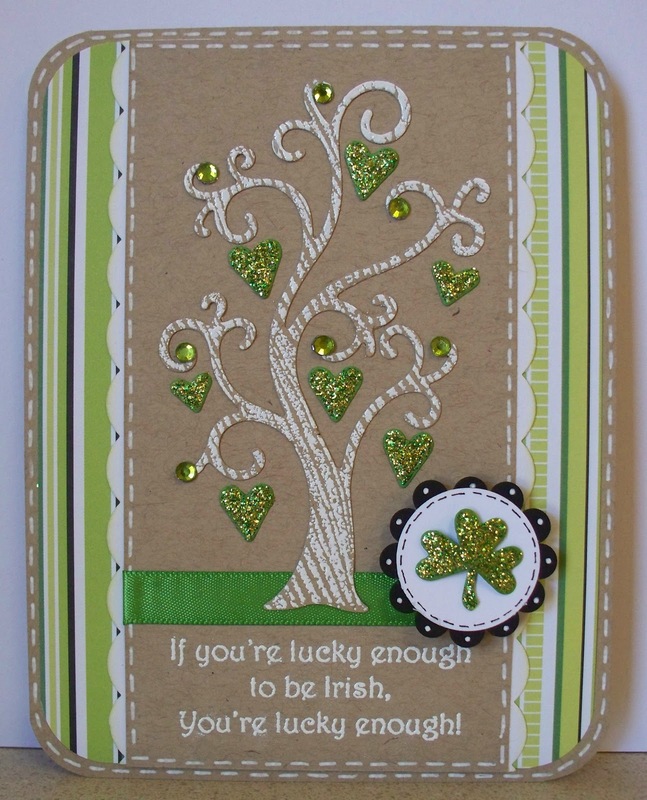 .. in the world . . .am I going to find micro shamrocks without using foil confetti. . . than I remember the PUB sign on the Irish Pub Die. . . .good save l!!! Just a short post today. Happy Valentine's Day to all of my blogging friends! Hope you spend some time with someone you love! I used Cottage Cutz Tiered Cupcakes to make this card. Enjoy the day! Ok, that's if for me today! See ya next Sunday! Good morning! WOW! Have we seen some awesome creations this week, or what? Our design team has provided us with some wonderful inspiration, and I hope I can keep that momentum going. I have two cards to share today, and I used the same layout for both cards. I simply couldn't decide between the Puppy with Valentine die, or the Kitty in Envelope die, so I threw caution to the wind and did them both! I know, living dangerously, right? LOL!!! Since returning home from CHA, it's taken me a while to find my routine again, but I was totally inspired to use these adorable dies that arrived right before I left. While at CHA, I was blessed to be working beside the very talented Barry who is also a designer for The Scrapping Cottage, and I have to say that Barry is one of the most knowledgeable people I've met in this industry. Barry knows so much about so many areas of this business, and it was truly a wonderful experience getting to know him, and watching him work. One of the tips that Barry shared during his demonstration was how to add a beautiful little pop of sparkle with the glitter Gelly Roll pens. Instead of trying to color in an entire area on your die cut, Barry recommends that you place a little line of color down with your pen, then take your finger and blend the area to spread the sparkle around. I have used this so much since returning home. It's so much easier than getting out the glitter and glue pen, and it is such a pretty effect! I've sparkled up the edges of my puppy, kitty, and the conversation hearts using Barry's technique, and I think you can see what I mean about how effective it is. I wish it would photograph better, because it's really beautiful!! In addition to the Kitty and Puppy dies, I used the Conversation Heart Mini die. I love that these dies emboss the I *heart* U sentiment, because it allows you to fill in with a gel pen in any color you want. Thanks so much for stopping by today. I hope you have a warm and wonderful weekend! Happy Crafting!!! 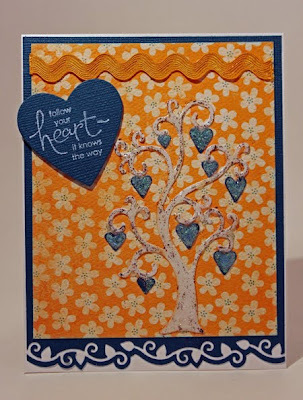 Ok, so for my first project this week, a Valentine card, I've used the adorable cottage cutz giraffe, heart locket die, and for the tiny heart, the tree of hearts. And for this treat box, I used the plain heart from the heart locket die to make the window then outlined with hand stitching and scallop doodling. For the window, I recycled packaging from my BigShot cutting pads. Works great for windows like this one! Thanks for coming by today. And thank you again for the love while I've been sick. I've really missed creating and sharing and it feels so good to be back at it again. This is my last post before the 14th so I'll wish you now a Happy Valentine's Day! Have you seen our booth at CHA?